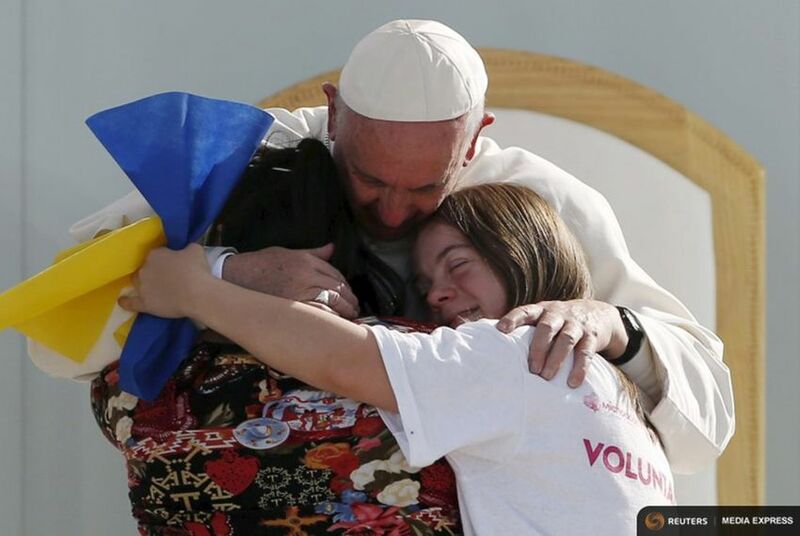 During a whirlwind, one-day visit to Ciudad Juárez on Wednesday Pope Francis delivered poignant remarks on immigration and corruption, keeping intact his reputation as a polite but no-holds-barred pontiff. EL PASO — Within plain sight of Ciudad Juárez, their sister city just south of the Rio Grande, thousands of El Pasoans heard Pope Francis speak of the ancient city Nineveh, a once-great place where the people thrived. The stirring message delivered in a city recovering from years of its own death and destruction at the hands of warring rival drug gangs and law enforcement held audiences captive on both sides of the river. The Mass — celebrated in Ciudad Juárez and broadcast to thousands at Sun Bowl Stadium in El Paso — capped off a whirlwind one-day trip to the city considered just a few years ago the “Murder Capital of the World.” Thousands lined the streets to catch a glimpse of the pontiff, who delivered on expectations that he would be as outspoken on social issues as during the rest of his trip to Mexico. He implored officials to have mercy on the immigrants who are abused as they make their way northward. He also asked what officials were to make of the thousands of women who have disappeared in the industrial Mexican city since the 1990s. But Francis left on a positive note, trying to instill in audiences on both sides a message of hope and patience. He said he is always surprised by Mexico and thanked the country and its people for welcoming him. “This time for conversion, this time for salvation, is the time for mercy,” he said. Betty Mitchell, 69, who was raised in El Paso but now lives in Waco, said the message of compassion and self-awareness was exactly what she expected. State Rep. Cesar Blanco, D-El Paso, attended the stadium event and said he hoped the message on immigration would resonate 600 miles to the east at the state Capitol. Media officials at the stadium said the diocese sold more than 30,000 tickets for the event, though actual attendance was unknown as of press time. The stadium, which seats about 51,000, appeared more than half full for the duration of the nearly two-hour event. Mexico's and Texas’ younger generations were well represented at the events, adding to Francis’ reputation as a church leader for a new generation. The Mass capped off a trip to that also included a visit to the state prison, where Francis urged the 700 inmates to remember that a new path to salvation was still possible. “[You] have not forgotten that within your reach is the power of the resurrection, the power of divine mercy which makes all things new," he said, according to the Associated Press. At 8 p.m. local time, hundreds of thousands of Juarenses that had likely been in place all day remained standing to catch a glimpse of Pope Francis as he traveled to the city's airport.